Is anything in the world better than the fourth season of The Simpsons? That is not a rhetorical question; I genuinely want to know. There are many, many wonderful things in this blessed world: Christ’s compassion, a Labradoodle puppy frolicking in a park on a glorious summer afternoon, the love of a good woman or man, the films of Preston Sturges, Jennifer Connelly in a black bikini in The Hot Spot. But as wonderful as these things are, they cannot quite compare to the obscene pleasure and comic perfection of The Simpsons in its prime. At the risk of being slightly hyperbolic, the fourth season of The Simpsons is the greatest thing in the history of the universe. A mere glance at the plot descriptions of the show’s fourth season is enough to induce Pavlovian giggle fits and shivers of joy. We all know how genius “Kamp Krusty,” “A Streetcar Named Marge,” “Homer The Heretic,” “Itchy & Scratchy: The Movie” and “Mr. Plow” are, but even the relatively unheralded episodes offer wall-to-wall laughs and some of the smartest, darkest, and weirdest gags ever Trojan-horsed into a network cartoon with a massive family audience. What other television show would feature a gorgeously designed sequence where a horrifically mutated Pierre and Marie Curie, their bodies swollen to Godzilla-like proportions from prolonged exposure to the radiation that would eventually kill them, destroy an Asian city with their bare hands like vengeance-crazed monster-Gods? If this gag were to appear in the script of any other show, it would die in a flurry of network notes. Because the audience couldn’t possibly be expected to know who the Curies were, let alone that they were married and died of radiation poisoning, and devoting precious time to a scene of the scientists as Mothra-like destroyers does nothing but waste time and alienate an audience that just wants to hear characters spout their catchphrases. But The Simpsons played by different rules than every other show on television. It became a massive cultural phenomenon because it was so smart and different and weird, not despite it. It only takes a little tweaking for the Simpsons’ home to become a full-on freak show, with Homer as its perpetually apoplectic main attraction. Homer, meanwhile, tries to alleviate the family’s problems in the cheapest, most perfunctory manner possible, by picking up The Half-Assed Guide To Foundation Repair, a Troy McClure-hosted instructional video (you may know the host from such instructional videos as Dig Your Own Grave And Save!) that promises a quick and easy path to home improvement but turns out to be a dense, six-hour-long gauntlet of impenetrable home-repair jargon delivered by McClure as if describing the easiest process in the world. Phil Hartman, the voice and soul of McClure, was the king of making everything sounds cheerful and positive, no matter how grim. McClure was the personification of smarm. He alone could say, “Your children are missing. I know because I murdered them with my own hands!” and make it sound like good news. When fixing the home himself proves impossible, the Simpsons are forced to look for ways to raise the $8,500 it will cost to fix their home’s foundation. So they attend a retirement dinner for an ancient coworker of Homer’s who is being hurled into an unwanted retirement against his will. 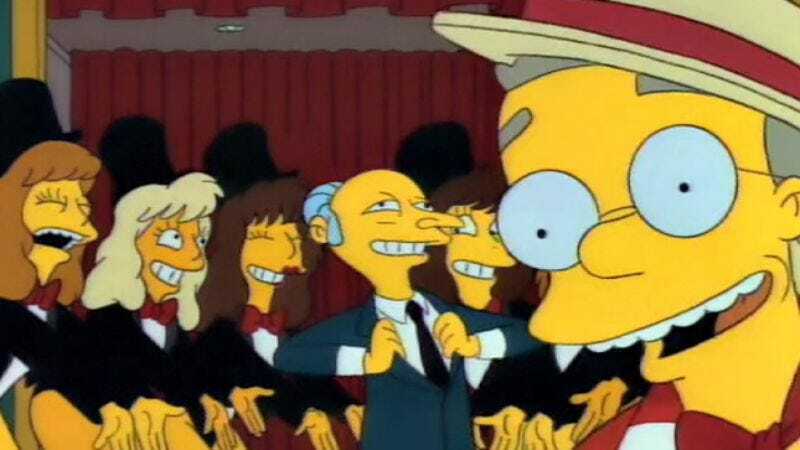 In a brilliant bit of misdirection, Smithers sings a song in “tribute” to the retiring worker that quickly turns into a hilariously hyperbolic ode to Mr. Burns. A long-overdue party for a sad old man becomes a grotesque, histrionic celebration of a man whose life is one long party for himself. The sequence is a hilarious commentary on Mr. Burns’ boundless self-regard and myopia as well as Smithers’ sycophancy, but it also organically and hilariously provides a central plot point in clearing the way for a new employee at the plant. Fortuitously, Marge is looking for a job after an endless hiatus from the working world. After Lisa helps her mother “polish” up her résumé so that she now appears to be the most accomplished woman in the world, Marge lands a job at the power plant operating a machine her ridiculously padded résumé claims she helped invent. Coldly perusing his surveillance cameras one day, Mr. Burns spies nothing but grotesque misconduct: Instead of working, his employees engage in limbo contests, chess games, and, of course, cockfights. (What workplace is complete without the occasional cockfight?) Then he settles upon the image of Marge doing nothing much in particular and is instantly smitten. Marge may not be doing anything useful or productive, but at least she’s not cleaning her gun with a crazed gleam in her eye while insisting, “I am the angel of death. The time of purification is at hand” like some of her fellow employees. The grinchy Mr. Burns suddenly turns attentive and generous, lavishing Marge with orchids and fragrant bath oils and listening to her when she suggests that employee morale might be improved by healthy snacks, theme days (“Like Child Labor Day?” Mr. Burns volunteers eagerly) and Tom Jones songs. It’s Beauty And The Beast time as a lovestruck Mr. Burns tries to win Marge’s affections by, among other desperate measures, kidnapping Tom Jones and forcing him to play at a romantic dinner for them. When Marge rejects Mr. Burns’ advances, he coldly fires her. This leads, inevitably, to the entrance of Lionel Hutz, who offers Marge a belt of scotch. When she protests, “It’s 9:30 in the morning” he responds, without missing a beat, “Yeah, but I haven’t slept for days!” Lionel Hutz is Lionel Hutz, however, so even though he tells Marge that her case is just what he needs to rebuild his shattered practice, he’s scared away by Mr. Burns’ army of lawyers and Marge and Homer must settle for a private Tom Jones concert when an uncharacteristically generous and tender Mr. Burns realizes just how much Homer loves Marge. 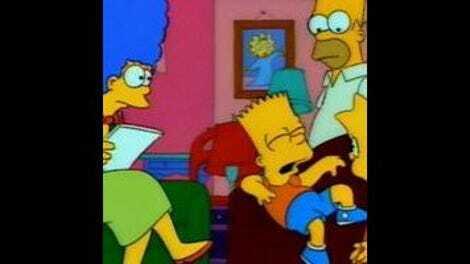 In the B-story, Bart goes from metaphorically crying wolf to literally crying wolf when a timber wolf escapes from Krusty’s studio after getting freaked by loud noises. The wild beast ultimately menaces Bart in his schoolroom before Groundskeeper Willie strips down and saves the day by defeating the wolf in combat. “Marge Gets A Job” is just about perfect. There is not a wasted sequence or unfunny gag. It’s head-spinningly smart in a way that doesn’t call attention to itself—like setting the retirement party at The Spruce Caboose, a giant, unwieldy, trainwreck-themed eatery whose name and conceit are brilliant parodies of Howard Hughes’ giant wooden airplane, the Spruce Goose. In its golden prime, The Simpsons did things no one else would and did them better than anyone else possibly could. In the process, it created a legacy that is still unmatched two decades on. How brilliant is Homer’s Henry David Thoreau fantasy? Mr. Burns on the night he dug up Al Jolson’s corpse: “Oh, that’s right. He’s dead. And rather pungent. The rest of the night is something I’d like to forget.” Surprisingly, that did not go well. Next up is “New Kid On The Block” followed by “Mr. Plow.” If memory serves, those are good ones.